In honor of Cinco de Mayo thought I would share a recipe with a Tex-Mex flair. 1/2 cup mango juice — use the kind without corn syrup for better results. Make marinate for chicken — mix pineapple, garlic, brown sugar, sweet chilli sauce, olive oil and pepper in food processor or blender. I prefer to use my Ninja. Place chicken in an airtight container or zip-lock bag. Reserve about about 1/4 cup to of marinate to use for cooking. Pour the rest of the marinate on chicken and cover. Marinate for at least 30 minutes. 1 hour is better. While chicken is marinating cut veggies for roasted veggies. Make a foil packet with peppers, garlic and onion for salsa. Slice pineapple large enough that it won’t fall through the grating of the grill. Wrap tortillas in foil packets. I usually put about 4-5 in a packet. Once the grill is fired up and ready. I usually do this one on the gas side of my grill. Place veggies for salsa and pineapple on grill for about 3-5 minutes. Just until it starts to char. Remove from grill and allow to cool before assembling the salsa. Next add chicken and roasted veggies to grill. Check the chicken about every 5 minutes flip when done on first side. 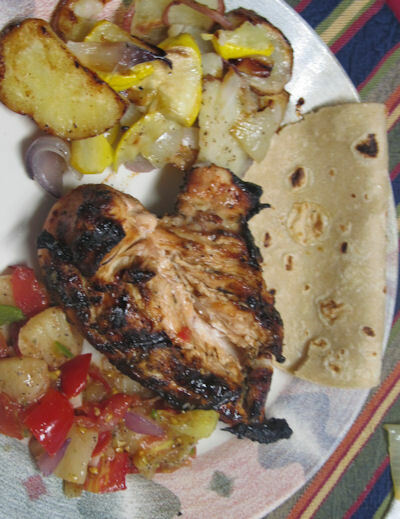 Once the 1st side of the chicken is done throw the tortilla packets on the grill for a few minutes. Assemble salsa: Roughly chop peppers, pineapple, onion and mango. Toss in a bowl. Smash garlic and toss in bowl. Mix veggies. Next add spices, lime juice and stir.